Established industry leader, Bridge Education Group, with over 30 years’ experience in the field of teacher training and international education, is proud to announce the launch of our newest product: The BridgeTEFL Job Board. We created the BridgeTEFL Job Board with both qualified English teachers and the international language schools who hire them in mind. Our innovative Job Board is a one-stop resource, seamlessly connecting qualified TEFL - TESOL course graduates with the very best English teaching positions around the globe. Thousands of our own BridgeTEFL course graduates and other TEFL –TESOL job seekers worldwide can enjoy free access to the Job Board, where reputable, Bridge-vetted English schools post the latest teaching positions. Using the Job Board, teachers can quickly filter open positions using any criteria they choose, such as location of the job, level of education required, salary, and more. Job seekers can also upload their resume, making it easy to apply for teaching jobs with a single click. 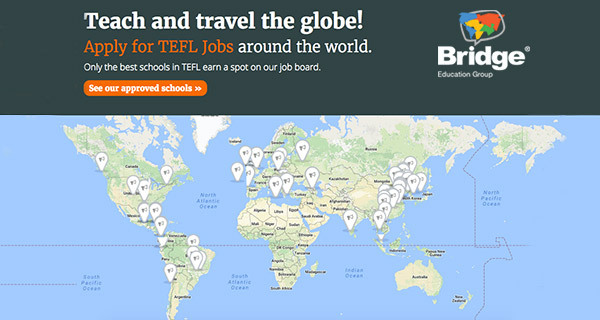 Schools abroad seeking qualified English teachers will also benefit from the BridgeTEFL Job Board. Once registered and approved, schools can post their open TEFL –TESOL positions as well as browse the database of teacher resumes. These fully vetted language schools can use search tools to easily find candidates who meet the specific qualifications they are looking for, such as teachers who have a university degree, TEFL certification, or a certain level of experience. The BridgeTEFL Job Board is yet another way that Bridge Education Group is working to foster international teaching and learning opportunities around the globe. To register as a job seeker or school and start browsing the Job Board, please click here.